Newly sourced from Madagascar, doTERRA Ginger essential oil is derived from the fresh rhizome of the ginger plant—the subterranean stalk of a plant that shoots out the root system. A featured ingredient in many Asian dishes, Ginger has a hot, fragrant flavor when used as a kitchen spice. In Western tradition, Ginger is most often used in sweets—gingerbread and ginger snaps being two examples. Internal use of Ginger is best known as a digestive aid and for helping to ease occasional indigestion and nausea. 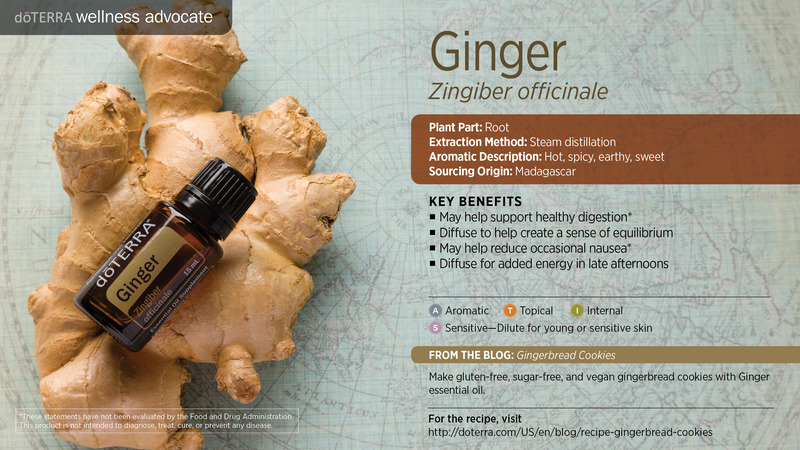 * Ginger essential oil can also be applied topically or inhaled for a soothing aroma. During a long car ride, diffuse or place a drop of ginger in the palm of your hand and inhale. Apply over lower abdomen for a soothing massage.